Our event venue in Russellville, Arkansas specializes in meetings, parties, and gatherings of all sizes! We have two event venues, which can be rented together for two simultaneous sessions, or as event prep area and a separate event space. The two spaces are the same size, and each accommodates between 50 and 70 people. 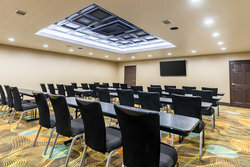 Hosting an event at Clarion Inn & Suites in Russellville also means your guests can stay right on-site in spacious lodgings, with options that suit any traveler. 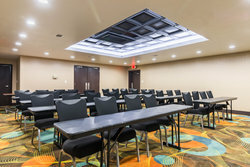 For lower rates on hotel blocks, simply inquire about our discounted group rates when you schedule your event. Meeting materials like a podium, pens, paper, etc. We can provide full-service catering right from Cagle’s Mill next door! Order off the menu and customize it to your event’s needs and your guest’s taste. For breakfast meetings we can do a full continental-style spread, and for lunch and dinner gatherings our classic American-style staples are always crowd pleasers! Let us help you plan the perfect gathering at our event venue in Russellville, Arkansas! 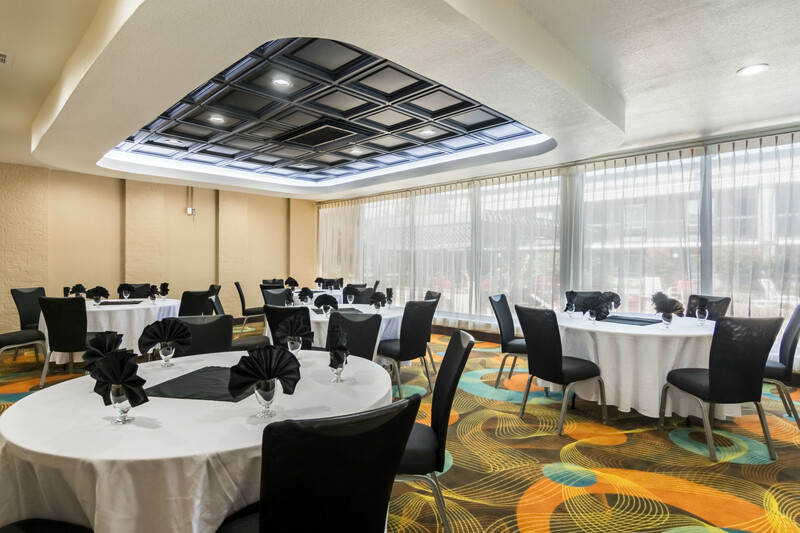 The 700 square foot Nebo Banquet hall has space for even more guests in a variety of configurations. This 600-square foot room is brightly lit with floor-to-ceiling windows. This event venue in Russellville can seat up to 70 guests.